MIDDLETOWN -- Mitch Hoffman and his New Canaan Rams have never been shy about setting big preseason goals. Every year, there are two clear-cut objectives: Win the FCIAC championship and win the state championship. On Sunday afternoon at Palmer Field in Middletown, the latter became a reality as the No. 4 Rams picked up a 3-0 Class L title game victory over No. 2 Waterford on the strength of a one-hit complete game by Andrew Casali for the school's first state championship since 1950. "All we tried to do today is go inning by inning. Each year we've gotten a little bit better. 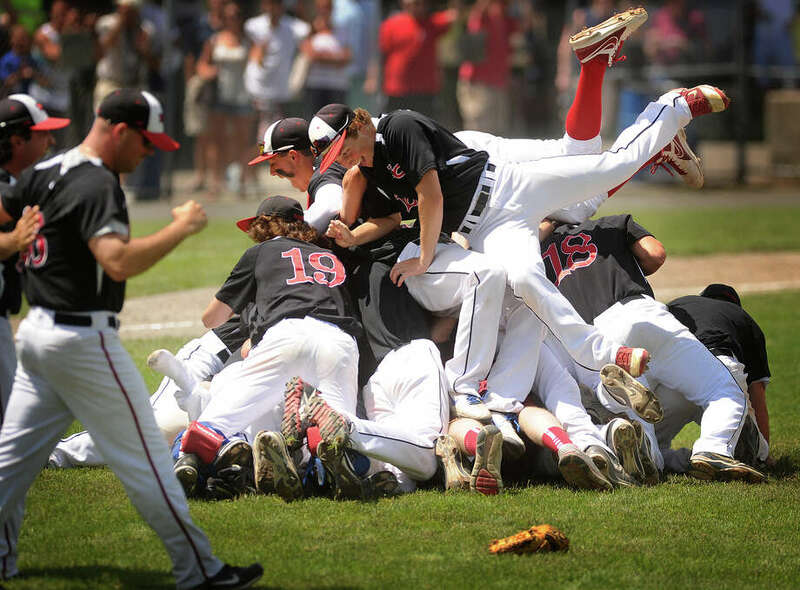 They know what (the first state title since 1950) means," Hoffman said. "The town has really helped us. We're trying to build a baseball community. It's definitely a lacrosse town, but it can be a lacrosse and baseball town." Over seven strong innings, Casali struck out seven and walked two. "I think we're all at a loss for words right now. Being able to experience this together is the best feeling in the world," Casali said. "This whole tournament, we didn't necessarily blow anyone out, but we were able to get the hits when we needed them." After Casey Ouellette and Matt Toth each lined out to start the game, Casali was hit by a pitch, bringing Brian Moran to the dish. Moran worked the count full before ripping an RBI double into the left-center gap, giving the Rams a 1-0 lead. New Canaan doubled its lead in the top of the second when Henry Lavieri's one-out double over the left fielder's head was followed up by Alex LaPolice being hit by a pitch, Grady Amrhein working a walk and Ouellette sending a hard-hit RBI sacrifice fly to center field, advancing all three runners. With a man on first and one out in the bottom of the second, Waterford's Kyle Willoughby launched a deep drive to the right field, but New Canaan right fielder Nick Cascione chased it down to make a running backhanded catch on the warning track. "We can build on this. Last year we got to the quarterfinals. This year we got through the quarterfinals to the championship game," Waterford coach Art Peluso said. "Maybe next year we'll take it one step further." Waterford pitcher Jordan Hamler retired the first two Rams to start the top of the fourth, but LaPolice drew a two-out walk and stole second to set the table for Amrhein. Amrhein drove a fly ball to left-center, where some miscommunication led to the ball being dropped and New Canaan taking a 3-0 lead. Leading off the bottom of the fourth, Seth Hoagland picked up Waterford's only base knock on a sharply hit ball to right, but he was erased one batter later on a brilliantly turned double play by Amrhein, Toth and Lavieri. Lavieri managed to hold the bag while scooping the throw out of the dirt. "Having that battery today (Casali and Ouellette) -- you would not want anybody else there, and they've been doing it since day one. I tip my hat to both of them, and they get to go out setting some history," Hoffman said. "Congratulations to all the seniors. They set some history. They always have a place in New Canaan history, and for me, a personal place." Three outs away from the title in the top of the seventh, Casali went 3-0 to the leadoff batter before working back for the strikeout, then induced a flyout to LaPolice and struck out the next batter looking to seal the victory. "I had a little bit of nerves (in the seventh), but as soon as I got one over the plate I was able to calm down and ease myself a little bit," Casali said. "I wouldn't want to win it with anyone else. Our pitchers always pitch great. We had two hits today that's alright. It was enough to win," Ouellette said. "Andrew was on a different level today. He always brings the intensity. This is unreal. I can't find words for it." Records: New Canaan 21-4; Waterford 20-5. Batteries: NC-Andy Casali (W) and Casey Ouellette; W-Jordan Hamler (L) and Sam Strout.